The luminaire and lighting control industry is going through diverse phases in different regions of the world. Rise in awareness about energy-efficient light models is primarily fueling the demand for lighting control systems. As electricity prices continue to rise, government organizations are switching over to energy-efficient lights to reduce operational costs while improving safety and efficiency. The adoption of luminaire and lighting control is particularly gaining traction in urban areas for efficient lighting solutions. Another factor boosting the luminaire and lighting control market is the rise in living standards of urban communities in some countries. Governments as well as private organizations in these communities are making efforts to attain maximum efficiency in terms of lighting solutions. The luminaire and lighting control market is projected to expand at a CAGR of 5.6% during the forecast period and reach US$ 111.0 Bn by 2026. Governments of metropolitan cities, especially in developed regions, are shifting to greener technologies so as reduce carbon footprint and electricity demand. In line with the same, several measures are being executed by implementing energy-efficiency standards, imposing added import tariffs on traditional lamps, and endorsing LED lights. In addition to the development of LEDs, multiple companies are focusing on developing and providing street lights solutions in order to help reduce energy consumption and increase profits margins. With an increasing emphasis on green and clean lighting products, the deployment of energy-efficient lighting products for street lighting applications is anticipated to rise in the coming years. Another factor driving the luminaire and lighting control market in the near future is the trend of smarter buildings. Technologies such as integrated lighting controls are increasingly being adopted in varied sectors such as residential and commercial building. There has been a considerable increase in spending on lighting solutions to improve energy consumption in residential and non-residential building spaces. One of the fundamental aspects covered under smart buildings is the smart lighting system. Furthermore, according to a research study conducted by the Massachusetts Institute of Technology, lighting represents around 14% of the overall energy needs of a building. Thus, it is a major area to incorporate energy-efficient products and services. However, the luminaire and lighting control market faces a challenge due to higher cost of installations. The major obstruction in implementing smart lighting control solutions is the cost associated with these products. For Instance, energy-efficient lights and light emitting diodes are priced at approximately US $35 each, whereas compact fluorescent bulb costs approximately $2 to $15 each. On an initial capital cost basis, LEDs are more costly than more conventional lighting technologies. Several players in the luminaire and lighting control market are expanding their business through strategic mergers & acquisitions and partnerships with several industries due to expansion in the market and underlying latent demand. Osram acquired lighting services provider Maneri-Agraz, which will be a part of Osram’s lighting solution segment, to increase business in the South and Southwest regions in the U.S.. Prominent players in the luminaire and lighting control market include General Electric Co., Philips Lighting N.V., General Electric, Cree,Inc, Legrand S.A., OSRAM Licht AG, Eaton Corporation, Lutron Electronics Co., Inc, Acuity Brands, Inc., Hubbell Incorporated, and LSI Industries Inc.. Companies are focusing on expanding their business through strategic acquisitions and partnerships with several end-use industries. This comprehensive report by Transparency Market Research analyzes and forecasts the luminaire and lighting control market at the global and regional level. The report provides an analysis over the period 2016–2026, wherein 2018 to 2026 is the forecast period and the base year is 2017. An in-depth and unbiased market assessment has been made to offer readers in-depth and accurate analysis. The report emphasizes on all the major trends and services playing a key role in luminaire and lighting control market expansion from 2018 to 2026. It also focuses on restraining factors, market drivers, and opportunities of the luminaire and lighting control market during the said period. 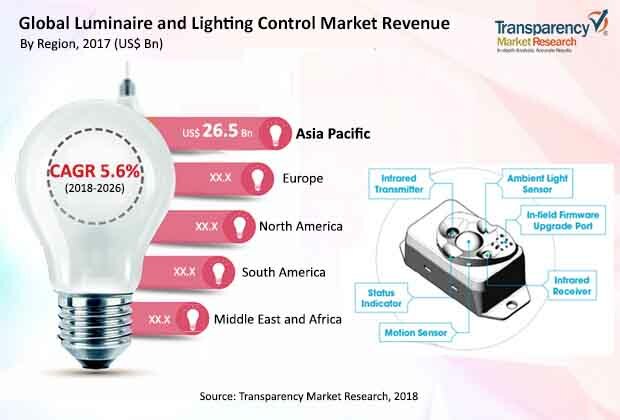 The study provides a complete perspective about the luminaire and lighting control market’s expansion throughout the research study in terms of value (in US$ Bn) across various geographies, including Asia Pacific, South America, North America, Middle East & Africa (MEA), and Europe. The report includes a detailed value chain analysis, which is focused on providing a broad view of the global luminaire and lighting control market. Porter’s Five Forces analysis is also provided to understand the competitive scenario in the global luminaire and lighting control market. The study incorporates market attractiveness analysis, where in the market segments for product, light, technology, component, and application are benchmarked based on their market size, growth rate, and attractiveness in terms of opportunity. In order to give a complete analysis of the overall competitive scenario in the luminaire and lighting control market, analysis of every geographic region mentioned in the report has been provided along with attractiveness analysis.